5 Stars / Top Pick Cookbook! My Prairie Cookbook is a must have for Little House watchers and readers alike. 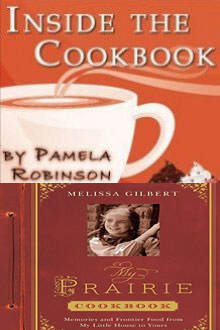 I was so excited to see that Melissa Gilbert compiled this. This was one of my favorite television shows growing up. I love looking at the pictures from the show and reliving fond memories. The bloopers and goofs section is hilarious and interesting. Place the cucumber slices on a flat plate. Salt them lightly, and tilt the plate so that excess water will drain off easily. Let stand 1 hour. Pass the cloves of garlic through the garlic press- add yogurt, dill, lemon juice, and salt and white pepper to taste. Stir until mixed. Add oil and stir vigorously until blended. Place the drained cucumber slices in a bowl, add onion, pour dressing over. Toss gently. Refrigerate for 1 hour and serve. There are many more recipes you will love in this one. Reminders of the prairie just make it that much more fun!